A package of DOT projects to fill out Harlem’s sparse bike network continues to languish, with local community boards delaying votes or declining to endorse the changes. The “Harlem Bicycle Network” plans grew out of DOT’s 2015 and 2016 workshops for safer biking and walking access to the Harlem River Bridges. In addition to two pairs of painted, unprotected crosstown bike lanes (on 110th/111th and 126th/128th Street), DOT has put forward a two-way protected bike lane for Fifth Avenue between 110th Street and 125th Street, connecting Central Park and Marcus Garvey Park [PDF]. Since the plans affect streets in Manhattan community districts 7, 9, 10, and 11, DOT’s typical practice of securing community board votes for every street redesign poses distinct challenges. Last week, the CB 10 transportation committee tabled a resolution endorsing the crosstown lanes on 110th/111th. The Fifth Avenue redesign did not come up, said Transportation Alternatives Upper Manhattan co-chair Becky Hahn, who attended the meeting. Committee chair Raquel Vazquez has been receptive to the full scope of the Harlem bike improvements, said Hahn, but was spooked by vocal opposition from churches and residents on 126th Street and 128th Street. The border between CB 10 and CB 11 runs right down Fifth Avenue. Since the proposed protected bike lane is on the east side of the street, it’s under CB 11’s jurisdiction. After DOT’s fourth presentation on the topic last month, CB 11 asked the agency to come back with block-by-block renderings for the protected bike lane, said District Manager Angel Mescain. The board already endorsed the painted crosstown lanes, which were striped east of Fifth Avenue last year. “The committee heard the presentation [again in February], but still had some concerns about the proposal for Fifth Avenue,” said Mescain. And at CB 9, which covers Morningside Heights and West Harlem, the transportation committee has declined to endorse the crosstown painted lanes, which DOT first presented last June, according to CB 9 community assistant Ray MacLaughlin. The board has a long history of delaying basic street safety upgrades. Transportation committee chair Carolyn Thompson recently devoted her energy to fighting a DOT traffic-calming project on Amsterdam Avenue because it “removes a lane” for cars. The 110th Street bike lane also falls under the purview of Manhattan CB 7, which declined to endorse the project for a very different reason — saying DOT’s design did not do enough to prioritize cyclist safety. Although DOT prefers to get endorsements from local community boards for its street redesigns, it does not need them to move forward. I had wondered why DOT striped on one side of 5th but not the other. I should have known–the answer is always CBs! That would be absurd and require a complete re-evaluation of the system, but when it comes to keeping people safe in traffic we totally accept it. Ah, yes, another example of the characterize all decisions by all community boards as exactly the same. It was sure to happen but I wasn’t betting on it to be in the first comment. Citibike ridership in these neighborhoods is off the charts. The board's transportation committee declined to support painted lanes for 110th. DOT is expected to bring an upgraded plan back to the committee next month. In June, DOT proposed painted bike lanes for 110th Street between Riverside Drive and Frederick Douglass Circle, at the northwest corner of Central Park. Members of Manhattan Community Board 7 said that wasn't good enough, asking DOT to come back with a design that protects cyclists from motorized traffic. On Tuesday, DOT will come back to CB 7 with its revised design. If you want 110th Street to be safe for New Yorkers of all abilities to bike on, it's important to show up. 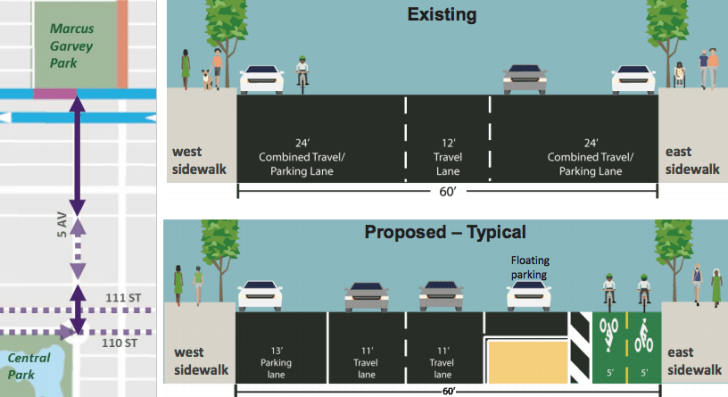 After 8 Years, DOT Finally Has a Bike Plan for Dyckman St. CB 12: Not So Fast.